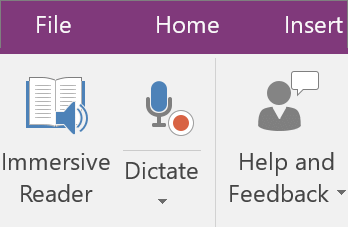 The Dictate feature is available with the Learning Tools Add-in for OneNote 2016 and 2013. For best results you’ll need a good microphone (a headset will work best), and a quiet place without background noise. If you haven’t yet, install Learning Tools for OneNote. Open OneNote, then select Learning Tools > Dictate. When you see the highlighted piece of text "Listening..." or a red circle appears over the Dictate button, begin speaking loudly and clearly. When you're done talking, select the Dictate button again to stop the recording. If dictate doesn't work, try these troubleshooting tips﻿.